This is a story about the first time I headed out to draw a tree after completing my Drawing Practice course with Roz Stendahl. Let's just say I will clearly never draw a tree the same way again. I am grateful I live in the woods with a driveway that is about a quarter mile long, which I walk with my dogs. So I look at this tree every day multiple times. But today, pen and journal in hand, it was like I had never seen it before. 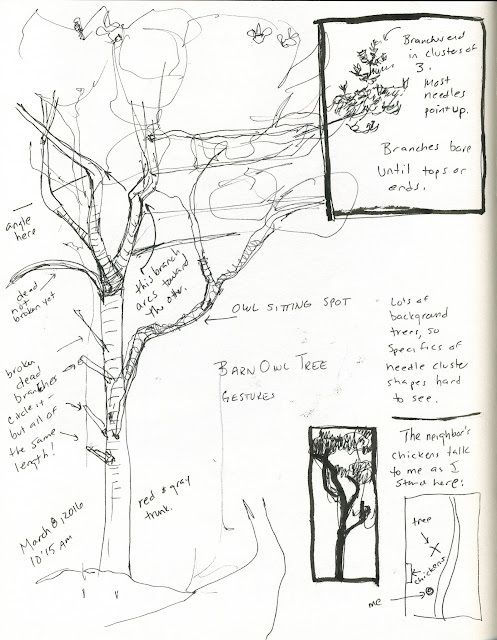 Anyhow, I wound up NOT drawing the tree, but studying the tree. Discovering structures and angles and in particular, the way the branches related to each other and the negative space. It was kind of mind blowing. I'm so very pleased with the whole experience, which I will remember thanks to the journal page. One of the things I love most about my sketching practice is how--so far at least--it never stops showing me new wonders even in the most familiar things.